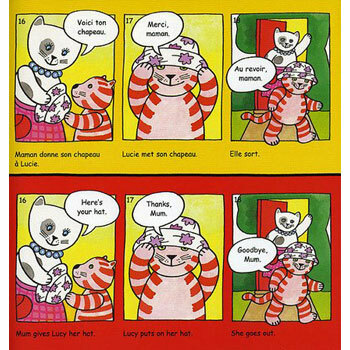 The Lucy Cat French series features dual-language comic-strip books that have been developed especially for early language-learning. The simple, bilingual text is displayed in speech bubbles and captions arranged in a practical double strip: French above, English below. In Lucy Cat at the Farm / Lucie Chat à la Ferme, Mummy takes Lucy the cat on a trip to the farm. When a raging bull suddenly appears, it is brave Lucy who saves all the other animals from harm! The high-quality colour illustrations, carefully-controlled bilingual text and frequent repetition will introduce young children to French in a natural, relaxed way. The book includes a short, attractive bilingual picture dictionary (with pronunciation guide) to identify new key words in the foreign language. 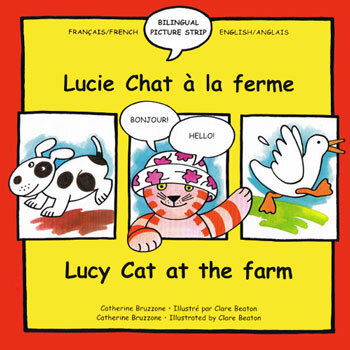 Lucy Cat at the Farm / Lucie Chat à la Ferme is suitable for early readers and / or parents with little previous knowledge of French wanting to read this with their child. A useful parents' guide and simple-to-use pronunciation guide are included.